I hope everyone had a wonderful Thanksgiving with their family and friends. Our family gathering was very nice. I think this year's turkey was the best ever. My dad's job was to carve it once again. Great-Grandma B. tried a new recipe for cranberries. I am not sure everyone was happy with the change. We have two new babies in the family that had their first Thanksgiving meals. My daughter loved the peas! Great-Grandpa B. told a whopper of story about his friend waking up to go the bathroom in the middle of the night only to find his wife asleep on toilet. He has a story that makes the family laugh every time we get together. After every family gathering I wish we would have caught Grandpa B. 's latest story on video. Maybe at Christmas I will sneak a video camera into the dining room without him knowing! Miranda Paul is an author of over 40 eBooks for children. Her work includes Gambian folktales Kumba Am and Kumba Amul: A Gambian Folk Tale and The Fish Snatcher: A Wolof Tale from The Gambia, West Africa which are both available from the very popular iStorybooks App for iPad, Android, and online. Miranda said in an interview with Thoughtful Reflections, "I have a very close connection with many people, writers, and residents of Africa's smallest mainland country, The Gambia. I am afraid some of the stories will be lost if not written down, or translated/adapted for audiences outside the country." Miranda's passion for writing started at an early age. "I began writing picture books in elementary school, nearly 25 years ago. Farmer Freddy and The Robbery at Denmark State Bank were my first attempts at age 8." (Thoughtful Reflections). Her life is much busier now as a mom and teacher of English and Drama, but she still makes time for her writing. She freelances for magazines and other publications, but her "favorite genre is folk tales, especially wild and wacky retellings or multicultural fables." (Thoughtful Reflections). Back in 2003, I was abroad serving as a volunteer teacher in The Gambia, West Africa. I had only been in the country for about six weeks or so, but it was long enough to feel a little homesick. What was I doing 5,000 miles from home? Living without running water and occasional electricity? In a primarily Muslim country during the time America was about to capture Saddam Hussein? As my birthday rolled around, it was Thanksgiving week back home. I pictured all of my relatives gathering at my grandmother's house, eating familiar foods. I invited a friend over and decided to whip up some makeshift American food to make myself feel better. Before I knew it, people kept showing up...my fellow Gambian teachers, neighbors, etc. It then occurred to me that this was more than coincidence. I was being thrown a surprise party by people who had only known me for six weeks, and had never thrown a birthday party before! (Most Gambians don't celebrate birthdays.) Amazing! That night, I learned one of life's most endearing lessons: people around the world are much more similar than they are different, and if we extend our hand or cross a bridge into another culture, people are ready and willing to take that hand or meet us halfway across. I discovered how friendships, especially rare and unlikely ones, are actually pathways to peace. I'm happy to say that I am still in touch with many of these friends and I have returned to The Gambia four times since that trip. I plan to continue to show my gratitude to the welcoming people of The Gambia for I continue the 1 Million Books for Gambia literacy project. This week we downloaded and read Miranda Paul's I LIKE Books series which is available as an iPad/iPhone app from Grasshopper Apps. My boys enjoyed the bright and vivid photographs and the audio text features. I loved that I was able to purchase the app for a couple dollars and get over 37 eBooks in one app! Together we thought it would be fun to make our own I LIKE book to celebrate Miranda's birthday. 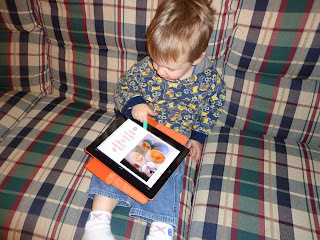 My son had the idea to make his own I LIKE THANKSGIVING eBook. At Thanksgiving dinner he used the iPad to take pictures of all the things he liked about Thanksgiving. 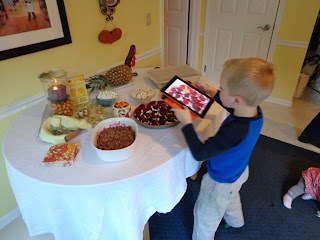 In this picture he snapped pictures of the dessert table. 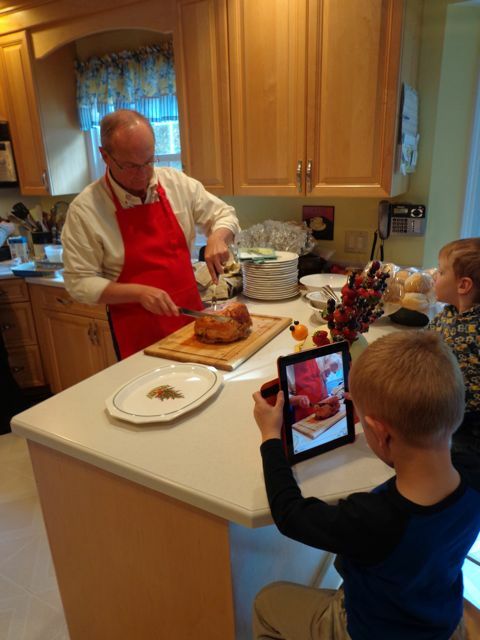 Here he documented his Grandpa carving the turkey. Once he took all the photographs we used the Book Creator app to add the text and audio. The Book Creator App made this project very easy to put together. The best part was that his younger brother got to enjoy the book when it was finished. Thank you Miranda for sharing your birthday story. We hope you have a fabulous birthday with your family. Good luck with all your writing adventures. I admire your desire to preserve the stories from the people of The Gambia. If you are a writer, Miranda is also the creator and moderator of the Rate Your Story website. This website matches published writers with aspiring authors. 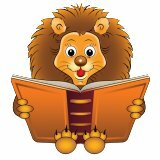 The published authors will read your manuscript and evaluate it free of charge! The synopsis of your Thanksgiving dinner made me chuckle, Eric! And I love what Miranda wrote: "people around the world are much more similar than they are different, and if we extend our hand or cross a bridge into another culture, people are ready and willing to take that hand or meet us halfway across. I discovered how friendships, especially rare and unlikely ones, are actually pathways to peace." So beautiful and true! Iza, Nobody tells a story like Great-Grandpa B. The best part is when he says...."I have got a story for you..." We never know what he is going to say! Agreed - - Miranda's birthday memory is perfect! I got an email from her saying ....."I know just the one" when I asked her to share a story. I couldn't wait for her response. She certainly didn't disappoint! I loved Miranda's birthday experience, and so echo what she says about similarities! That app is such a great deal and your I Like Thanksgiving book looks a real success! Thanks for sharing the link on FACEBOOK! I always appreciate your support! What a great celebration, all of it! Happy birthday, Miranda! And that I Like Thanksgiving book is fantastic! Thanks, Eric! Thanks Beth! I appreciate you sharing the link on Facebook. Thank you, Eric, for making another very special birthday memory for me! Your blog is truly amazing and your Thanksgiving story was charmingly written. Cheers!! You are welcome! I am so glad we were able to work together to get this post published in time for your birthday! I hope you have a great day! Wonderful post, Eric! It was great to read about Miranda's Gambia birthday experience. I appreciate Miranda's contributions to children's literature. Her love of sharing stories is evident. And, providing Rate Your Story for writers, is more than generous. Penny -- Thank you! I loved hearing Miranda's story too! And after writing this post I am inspired to submit a story to RATE YOUR STORY as soon as the submission window opens again! I may have told you before, but, I LOVE what you do with your children and how you inspire them to read and love books. This blog is such a great idea and what a blessing your birthday greetings must be to the authors you honour. I am glad you told me again! Thank you so much! I love Miranda's story and guess what Miranda? Today is my half-birthday (B-day is May 24). I also love Miranda's passion for making sure wonderful stories don't disappear. And finally, the I Like Thanksgiving Book is just too precious! Double checked - your birthday is on my calendar! You share it with a good one -- Candace Fleming! Excellent birthday info about Miranda! I liked her story about the Gambians reaching out to her on her special day! And Eric, that book app creator looks great! How neat your sons can make their own books! !